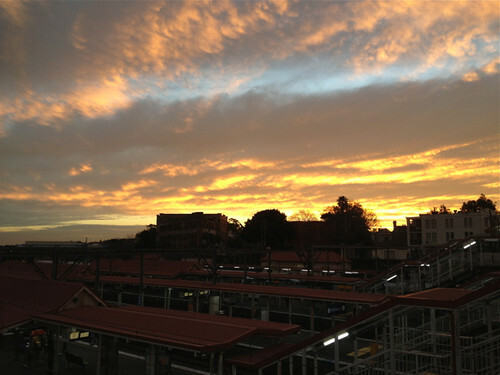 First, thanks to readers who commented on my last post. It does make a difference to know there are readers, and an even greater difference to know there are readers who take pleasure from my blog. I was surprised by the number of comments on my travel posts and so have decided to try to write some posts about places I visit in my daily life. 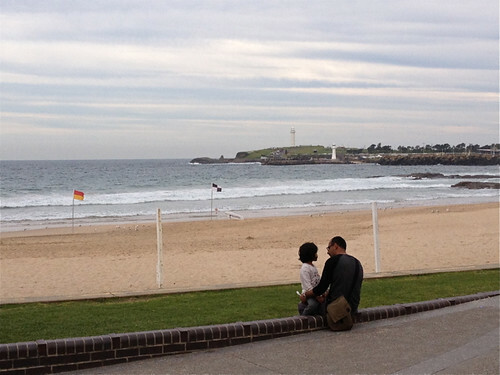 I love Sydney, and there are many aspects of it that it will be fun to write about. Yesterday I had a quietly perfect Sunday. My daughter was briefly visiting Sydney and the day began with breakfast at a local cafe before she flew back to Brisbane (Sunday breakfast out is such a Sydney phenomenon - and one that I love). Then, a knitting excursion. 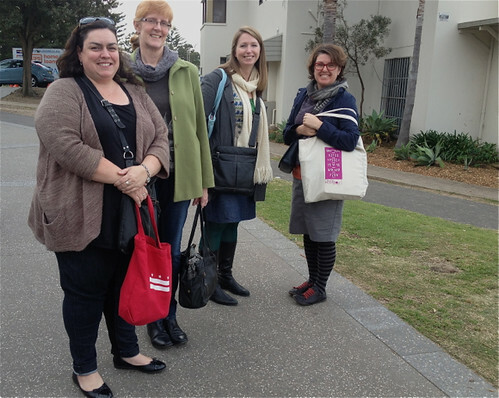 Not just a knitting meet-up, but a meet-up that involves companionable travel to and from the destination. This was a very low-key, almost impromptu excursion, with Margaret, Fee, Zena and I - all clad in various knitted garments and accessories - joining the train at various city stations and then making the hour and a half trip to Wollongong - knitting all the while. 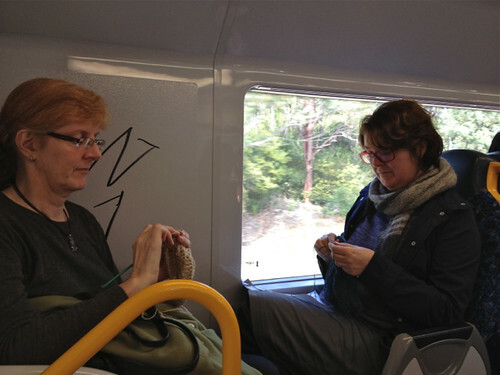 Often when you knit on trains or, more generally, in public places, you attract attention or comment, but our carriage seemed to be jam-packed with families too intent on a day's excursion to notice us, or, maybe, we were just too involved in knitting and chatting to be aware of any attention we attracted. Kylie met us at Wollongong and we went on to have lunch, and knitting, and chatting at a local restaurant that overlooks the beach. I enjoy the rambling conversations while we eat and knit. I enjoy the perspectives people bring from their work lives, whether it's film-making, the law, academia, or engineering, and their passions, such as their families, cooking, reading, dogs, quilting or singing. And I particularly enjoy the way these conversations are regularly interrupted by comments about knitting or crochet patterns, or yarns, or alternative knitting techniques. What we have in common is our love of knitting, but over many of these excursions and meet-ups we've come to know each other so well that the conversations flow easily, companionably and supportively. That's how I spent Sunday. How fortunate I am. Earlier this month I passed my five year blogging anniversary. Unnoticed. Unremarked. A bit sad, really, when for so much of these last five years blogging has been such a taken for granted part of my life. I've also noted that it's almost a month since my last post, which is the longest time to have passed without posting since I began my blog. A bit of a hiatus. Seems to me that it's time for a reassessment and some decision-making. The blogging world has clearly changed in the last five years. When I began my blog I can remember being concerned about whether I was catching a wave of blogging as it had reached its peak. Why I should have been concerned about this is a bit of a mystery - did I not want to seem uncool? Sad thought. Nevertheless, I think I was probably right that blogging was then at its peak of appeal and about to trend downwards. Developments in social media, particularly the 'short forms' of facebook and twitter, have a more immediate appeal that better serve some of the purposes blogging initially served. I have some friends who post nimbly across social media formats, including blogging, and engage a wide range of readers. One friend selects particular formats for particular purposes and uses the longer blog format for more reflective and critical writing while reacting immediately and often explosively through shorter formats. The majority of the bloggers I've read over the last few years are posting less frequently and often more perfunctorily, almost as if saying 'I don't really have the inclination to blog but I just want you to know that I'm still here'. There are some blogs I greatly miss as their writers wrote less frequently and then disappeared. Some of the knitting and craft blogs that originally inspired me to reenter the world of knitting and to begin my blog have long since vanished into the ether. What to do? I guess I, like many others, could just cease blogging. But I don't want to do this. Even though I don't really enjoy writing, I like the way it makes me discipline my thoughts and consider my opinions and judgments. I have a notoriously bad memory for past events in my life and find that writing about them better anchors my memories. Blogging provides an opportunity to link words and images so that at least some of the photographs I take can be viewed and contextualised, rather than being part of the muddle in a box of photos or on my computer. So I don't really want to stop. But I also don't want to continue blogging in the rather desultory way I currently am. 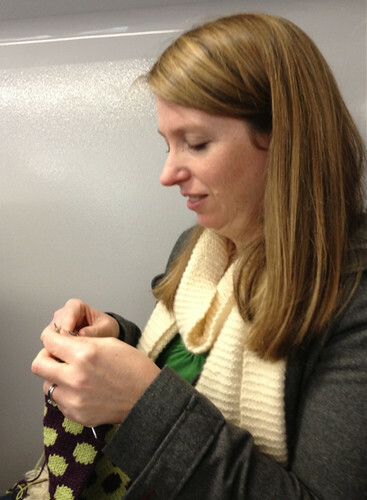 I started blogging, way back in 2008, because of my knitting. Rather grandiosely, I wrote that I wanted to reflect on the context in which my knitting happens; how it fits around the rest of my life and into my relationships. Over time I think I've done this less and less. Now when I post about knitting it's usually simply descriptive of the project and my reaction to it. This is a bit ironic because across the time of my blog the relationships developed through knitting have become richer, more diverse, and worthy of reflection and comment. I predicted in my first post that 'inevitably, I imagine I'll also want to mention and try to sort out my thoughts about the other things that happen and are important to me - family, friends, books, theatre and films, travel'. I'm struck by the accuracy of my prediction - or maybe by the predictability of my life. OK. I want to continue blogging, and my original ideas for the blog are still the chief concerns of my life. I just need to post more frequently and use the blog more reflectively. Pull up my socks (knitted or otherwise). In the past I've had some success with setting goals on the blog and reporting on my achievements, or lack, in meeting them, so I'll set a blogging goal. For the next two months I will post at least twice a week. In my most productive blogging year, 2010, I wrote 120 posts - more than two a week - so I think the goal is achievable. Keep your fingers crossed for me or, more practically, comment from time to time. That would really encourage me.